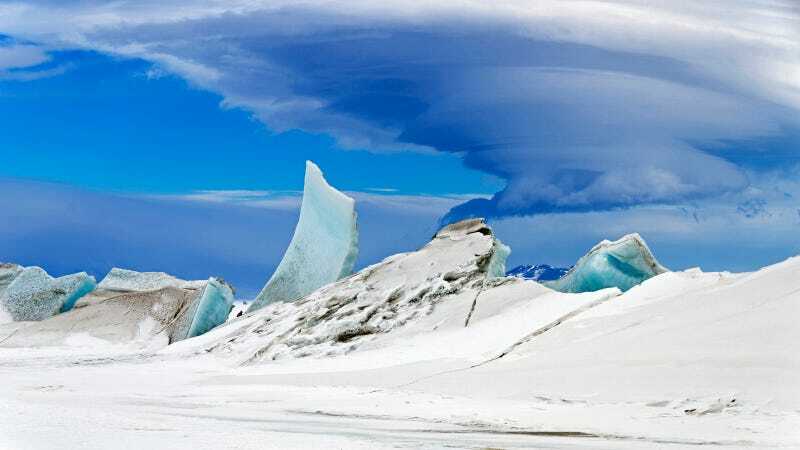 This might look like result of some pro-level CGI, or perhaps even a glimpse into your imagination, but in fact it's a photograph taken in Antarctica just this last week. As part of Operation Ice Bridge—a multi-year mission to monitor conditions in Antarctica and the Arctic—NASA researchers have just been on a week-long ice-surveying mission. Along the way, they took plenty of photographs. Lenticular clouds are a type of wave cloud. They usually form when a layer of air near the surface encounters a topographic barrier, gets pushed upward, and flows over it as a series of atmospheric gravity waves. Lenticular clouds form at the crest of the waves, where the air is coolest and water vapor is most likely to condense into cloud droplets. The bulging sea ice in the foreground is a pressure ridge, which formed when separate ice floes collided and piled up on each other.